Out at midday to catch up with Val. Coffee in the usual place and an hour or two of chat, then back to pick up Scamp for a visit to Simpson in Larkhall to pick up new lenses for Scamp and new specs for me. Couldn’t decide on dinner and finally opted for pizza, home made of course. After making the dough, I knew I had at least an hour to wait for it to prove before I could start, so that was as good an excuse as possible for a seat in the garden under a partly cloudy sky to read and drink a glass of wine. We even got a chance to use our Garden Scotland glass holders. 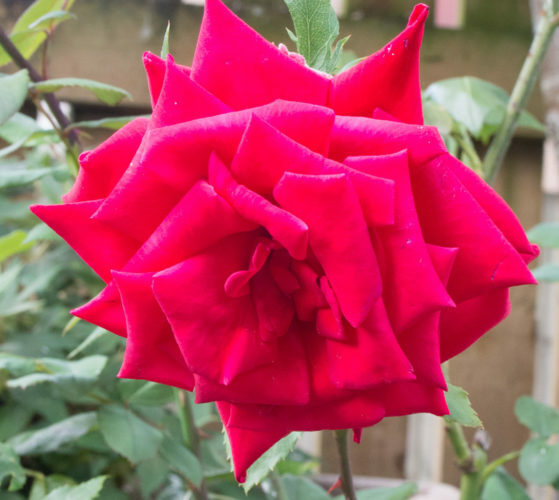 Took some photos of flowers and things in the garden and the Ruby Wedding rose got PoD. Pizzas were made and consumed and basically that was it for a warm Friday with just the hint of dampness in the air. I did detect a couple of tiny spots of rain on my Kindle, but it didn’t come to anything. Tomorrow I think we’re going to Glasgow to see the Gay Pride march. It’s been quite an ‘interesting’ show for the last two years. Hopefully the rain will stay away for another day.